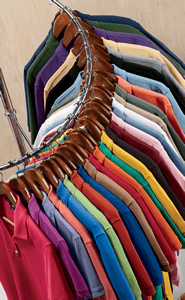 Comfort Colors comes to you from the same brand family as Gildan, Anvil, and American Apparel. What differentiates this line of apparel is Comfort Colors' tried and true garment-dye process that has been perfected over 40 years. Garment dyeing creates longer-lasting, exceptional pigment retention and softness, as the dye is not applied until after the shirt is created. This gives it a lived-in quality straight from the factory, and also eliminates excess shrinkage. This is important when you are considering a brand to apply screen printing, foil printing, transfers, CAD cut vinyl, sublimation or embroidery. Comfort Colors also designed their color spectrum with nature in mind. Inspired by the great outdoors, their quality tees like the 6030CC pocket t-shirt, long-sleeved t-shirts, hoodies such as the 1568 full-zip hoodie, sweatshirts and tanks all make an unsurprisingly wonderful blank canvas for your custom artwork, which will stay true to size and shape. If you want the same well-crafted quality, but are looking for something other than clothes, we also offer Comfort Colors hats, totes and bags at wholesale prices. All of these items come ready to be customized. With over 95 colors available in their lineup, you can see why Comfort Colors is the brand of choice when a limited number of classic and traditional colors just won't do. Make your artwork pop, and rely on the perfectly balanced fabric blends and double stitched pieces to hold it all together. Comfort Colors oversees each step of the production process, ensuring superior construction and the softest hand possible. Whether you purchase one Comfort Colors wholesale item for yourself or enough to stock your own printing business, you can still take advantage of t-shirtwholesaler.com's discount combination pricing, which accrues based on the total number of items in the order, even if they are different.